- skj on 七月 10, 2016. 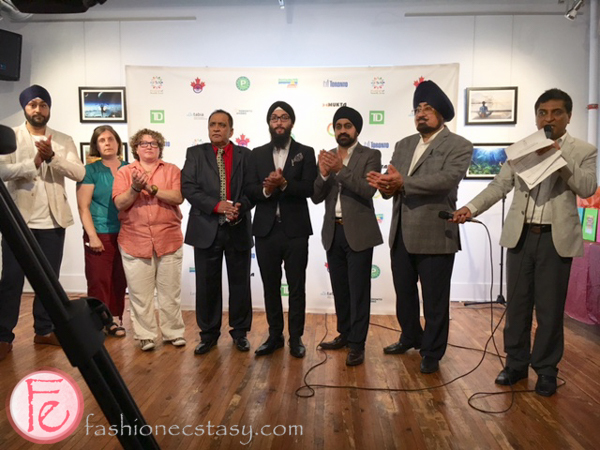 Yesterday the Gerrard India Bazaar BIA Committee hosted a VIP/Media reception for the 14th Annual TD Festival of South Asia 2016. MCs Vasu Primlani and Randy Persaud kicked off the event by welcoming everyone in attendance, including local lawyer Mel Solomon and MP Paula Fletcher, who spoke glowingly of the South Asian festival’s past success and looked forward to Bollywood dancing later this week. The festival is an annual showcase of the rich South Asian culture and heritage thriving in Toronto. This year’s highlights will include performing, literary and visual arts as well as mouth-watering South Asian food. There will also a unique South Asian culture “gully” or alley replicating a traditional Indian street scene complete with a potter and wheel, handmade kites and various other handicrafts on display. Clown yoga or “Cloga” will also be demonstrated as will the newly-minted “Bollyoga” which is self-explanatory. Bollywood will also be evidenced throughout the week with performances by musician Ali Quli Mirza, the rock group Sirens of Shanti and youth heartthrob Raghan. There will even be an opportunity for fans to meet a producer so be sure to dress in a Bollywood style for your chance to impress. Media personalities Tahir Aslam Gora, Tarek Fatah and dancer Ashima Suri will also be making appearances during the festival. Attendees were treated to a selection of Indian snacks. North & South Indian dishes included both vegetarian and non-vegetarian options like chaat papri, seekh kabab, idli sambar, hariyali kabab and channa. Catering was provided by Motimahal, a local favourite. Tipples included Steam Whistle beer, Argento Malbec and Pinot Grigio and, our favourite, a very refreshing sweet mango lassi. The reception also opened with a visual art exhibition series titled “Oneness” by South Asian artist Nilaoyy K. Nandi. This series aimed to interpret both the conscious and the subconscious and portray a transcendental journey through the medium of yoga. The Gerrard India Bazaar (GIB) North America’s largest marketplace for South Asian goods and services with more than 100 diverse restaurants and shops. GIB helps South Asians to both maintain cultural traditions and keep up with the contemporary lifestyle of the subcontinent by offering a slice of the Indian subcontinent. Their mission is to promote the South Asian culture and diversity and revive the Gerrard India Bazaar (BIA) which thrives along Gerrard Street. TD Festival of South Asia 2016 continues from July 16-17 on Gerrard Street between Coxwell and Greenwood Aves.